Two 35-year-old low-level professional tennis players you’ve never heard of, Ukrainian twins Gleb and Vadim Alekseenko, have been banned for life and fined $250,000 each, after being found guilty of match-fixing over an eight-month period in 2015 and 2016, the Tennis Integrity Unit said in a statement today. The punishment is the latest in a series of dozens of suspensions, bans, and fines handed down to low-level tennis players in the last six months, as the TIU attempts to make good on its promise to clean up the sport. The punishments for betting on tennis, corruption, match fixing, and associated offenses vary, with little to no discernible pattern for who gets banned, who gets suspended, who faces hefty fines, and who gets off with fine of a a few thousand dollars. For example, the combined half-million-dollar fine for the Alekseenko brothers is one of the steepest the TIU has ever handed down. The second-highest fine that the TIU handed down over the last 18 months was a $100,000 fine given to Ukrainian player Dmytro Badanov, who was also banned for life. Egyptian player Karim Hossam, however—who was found guilty of offenses over a five-year period from 2013 to 2017 and was banned for life—was not fined. Similarly, Romanian tennis player Alexandru-Daniel Carpen was banned for life in Jan. 2017, after admitting to match-fixing, but received no fine. Greek tennis player Konstantinos Mikos was banned for life in May 2017 after being found guilty of corruption-related offenses in 2013, but received no fine. Japanese tennis player Junn Mitsuhashi was banned for life in May 2017 after being found guilty of corruption and refusing to cooperate with the TIU investigation. He was fined $50,000. Vadim Alekseenko is 1,113th in the ATP rankings, with a career high of 497th in June 2014. Gleb Alekseenko is ranked 1,724th, with a career high of 609 in May 2011. According to ATP data, Gleb has a total career earnings (both singles and doubles) of $52,734; Vadim has earned $77,430. 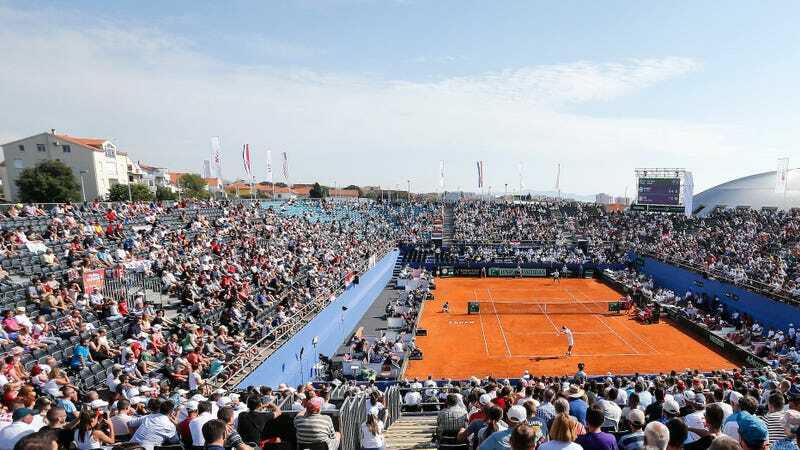 Nearly all the players punished by the TIU are low-ranked and lowly paid, playing primarily in Futures tournaments, which is what an independent panel tasked with investigating corruption in tennis announced as part of its findings in April. Among that panel’s set of recommendations was that the International Tennis Federation end its partnership with Sportsradar, an online betting company. That has not yet happened. Deadspin asked TIU about the apparent discrepancies in punishments. TIU spokesman Mark Harrison responded by stating that the TIU isn’t responsible for passing judgement on the players, Anti-Corruption Hearing Officers, known as AHOs, are. He also noted that the rules “provide for a range of sanctions and fines that are at the disposal of the AHOs” and that each case has different circumstances. So which circumstances explain why, specifically, the Alekseenkos were fined half a million dollars when, for example, Hossam—who was found guilty of offenses over a much longer period of time—was not fined at all? “I can’t say specifically why the Alekseenkos were fined to that extent, other than that the AHO must have assessed the circumstances of their co-ordinated and multiple corrupt activities at the highest end of the scale and used the tariff available to him accordingly,” Harrison said, noting that all decisions on sanctions and fines can be appealed to the Court of Arbitration for Sport.